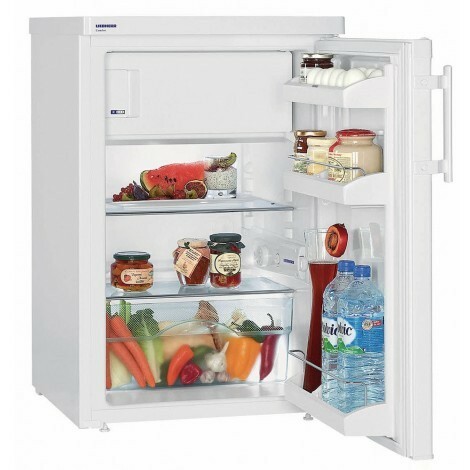 Enjoy savings in energy consumption with the A++ energy efficiency rated, Liebherr under counter TP1414 Fridge with freezer box, in white. This freestanding, 55cm wide, table height fridge has 122 litres total net capacity with 2 glass storage shelves, 3 door balconies and a vegetable bin. Transparent vegetable bins provide plenty of space for the organised storage of fruit and vegetables. In addition, they are easy to clean. The automatic defrosting feature of this fridge, also makes defrosting a thing of past. Fresh food can be frozen and kept in long-term storage in the 4-star freezer compartment. Temperatures of -18 °C and lower ensure that food is stored with all the vitamins and minerals preserved. The CoolPlus function reduces the temperature in the freezer compartment for several hours so that food can be frozen gently and safely. This function also ensures that the temperature in the freezer compartment is reliably kept at the required level in ambient temperatures of + 10 °C to + 16 °C (winter mode). In freestanding appliances which do not incorporate electronic units in the worktops, these worktops can be removed without any difficulty. The appliances are factory fitted with door hinges on the right. The reversible door hinges permit optimum use of the appliance wherever it is located.